Whether you're hitting the ski slopes, soaking up the wine regions, cruising down the Pacific Coast Highway or exploring big cities like Los Angeles and San Francisco, there's no better way to start your California Journey than with Delta Air Lines and Virgin. Delta Air Lines serves more than 180 million customers each year. In 2018, Delta was listed in Fortune’s Top 50 Most Admired Companies, in addition to being named the most admired airline for the seventh time in eight years. Additionally, Delta has ranked number one in the Business Travel News Annual Airline survey for an unprecedented eight consecutive years, as well as being named TTG Media’s UK Airline of the Year, Selling Travel’s Best Airline to North America, and Business Traveller’s Best North American Airline. With an industry-leading global network, Delta and the Delta Connection carriers offer services to 302 destinations in 52 countries, across six continents. Headquartered in Atlanta, Delta employs more than 80,000 employees worldwide and operates a mainline fleet of more than 800 aircraft. The airline is a founding member of the SkyTeam global alliance and participates in the industry’s leading transatlantic joint venture with Air France-KLM and Alitalia, as well as a joint venture with Virgin Atlantic. Including its worldwide alliance partners, Delta offers customers more than 15,000 daily flights, with key hubs and markets including Amsterdam, Atlanta, Boston, Detroit, Los Angeles, Mexico City, Minneapolis/St. Paul, New York-JFK and LaGuardia, London-Heathrow, Paris-Charles de Gaulle, Salt Lake City, São Paulo, Seattle, Seoul, and Tokyo-Narita. Delta Air Lines have teamed up with Virgin Atlantic to offer nonstop flights from London to the US with plenty of extras. 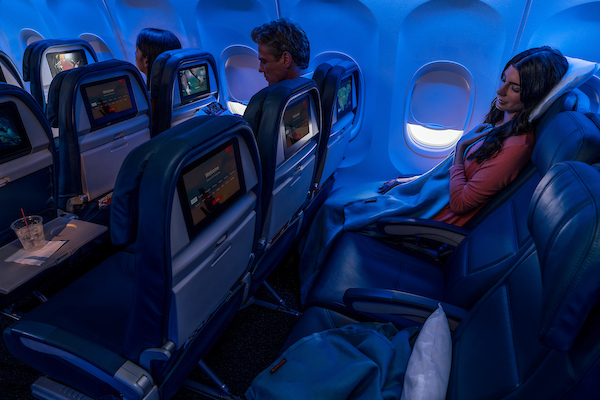 Entertainment: Catch up on TV, movies and music with complimentary seat-back entertainment from Delta Studio® and ergonomically designed earbuds. Stay connected through free in-flight messaging via iMessage, WhatsApp and Facebook Messenger*. Food and Beverage: Enjoy a wide selection of tasty meals and snacks as well as complimentary beer, wine, spirits, Starbucks® coffee and more. * Availability varies by aircraft and route; check your listing for details. Free messaging usage is restricted to select messaging apps. Enjoy more of the perks you need in Delta Comfort+®. Whether you want to work or relax, more legroom and extra recline is always better. Rest with a pillow and a blanket and refresh with a complimentary amenity kit that includes eyeshades, ear plugs, toothbrush and toothpaste. With access to dedicated Delta Comfort+ boarding and overhead storage space, you’ll be among the first on the aircraft to get your carry-on stowed away. And with your seat at the front of the cabin, you’ll be one of the first off too. 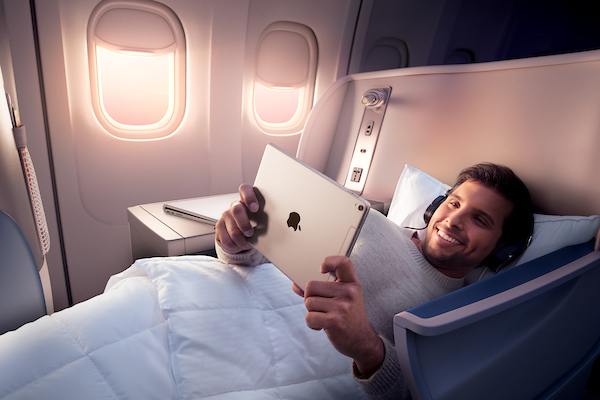 Entertainment: Catch up on TV, movies and music with complimentary premium seat-back entertainment from Delta Studio® and stay connected through free in-flight messaging via iMessage, WhatsApp and Facebook Messenger. Food and Beverage: In Delta Comfort+ you can sip on complimentary beer, wine, spirits, Starbucks® coffee and more. Plus, you’ll enjoy a selection of satisfying meals and snacks. 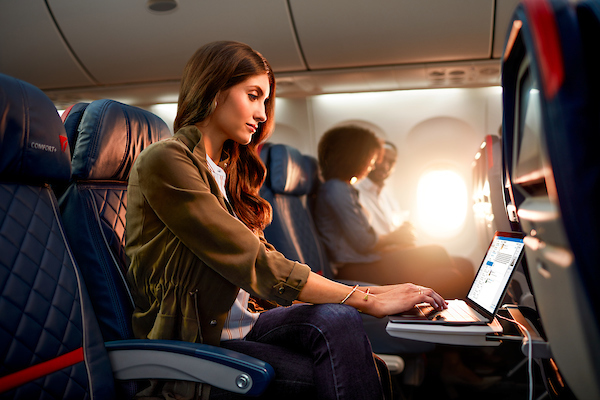 Entertainment: Catch up on TV, movies and music with complimentary premium seat-back entertainment from Delta Studio® and stay connected through free in-flight messaging via iMessage, WhatsApp and Facebook Messenger. Wi-Fi and in-seat 110-volt power and USB outlets included at every seat. Food and Beverage: Dine on regionally tailored, chef-curated meals, paired with wines selected by Master Sommelier Andrea Robinson, winner of three James Beard awards. Or power through the flight with fresh-brewed Starbucks® coffee. * Upper Class Wing service is available from LHR, providing seamless transfer from your car to the Virgin Atlantic Clubhouse. For more details on why we recommend flying premium with Delta Air Lines, see our First and Business Premium Airline Guide. Place commonly used items in a smaller bag under the seat in front of you for easy access throughout the flight. The checked baggage allowance may vary depending on your itinerary, class flown and frequent flyer status. The basic allowance between London and New York in Economy is 1 bag with a weight limit of 23kg. For customers travelling with a Basic Economy ticket to/from Europe and North America, a first checked bag fee of $60USD will apply to tickets issued on or after Dec. 6, 2017 for travel on/after April 10, 2018. Excess bag fees will apply for weight in excess of this amount. Delta One guests are allowed 2 bags at 32kg each. There is a size restriction on checked items of 62 inches (157 cm) combining length+width+height. Baggage allowances are greater for Elite Frequent Flyer members. Check with your Flight Centre Travel Expert for exact baggage specifications but generally Elite status members are allowed 1 additional bag in the corresponding class flown. Some bulky items such as golf clubs and other sporting equipment may be accepted as part of the free baggage allowance. There is an excess baggage fee for most other bulky items and your Flight Centre Travel Expert can help determine allowances and any possible baggage fees required. Some bulky and fragile items such as musical instruments can fly in the cabin with the purchase of an additional seat. There is no additional bag allowance for infants. Additional bag fees may apply for items checked over the standard baggage allowance for paying passenger. Try to book your flights around your infant's normal sleep times for a smoother journey. Dangerous and restricted items are never allowed to fly. Such items include flammable materials, liquids and gasses, explosives, fireworks, as well as gasoline powered devices which have previously been used. Gasoline powered equipment that is new and still in packaging may be accepted for carriage – i.e. chainsaws and other lawn equipment. Check-in is fast and easy when done online. Enter your reservation number on the “Check In” page of the Delta Air Lines website and you will be guided through the check-in process. Simply print off your boarding pass at the end and you’re ready to go. Proceed to the bag drop off counter at the airport where your passport and travel documents will be checked. Online check-in may not be available if an itinerary includes travel on a partner airline. 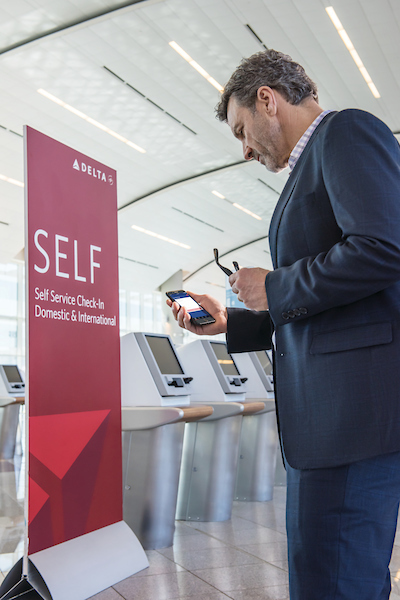 While not available in Australia, Delta Air Lines airport kiosks are quick and easy ways to check-in for your flight at the airport without having to wait in long check-in lines. Scan your itinerary or enter your reservation number, select the number of bags you’re checking and the kiosk will print your boarding pass. Proceed to the bag drop off counter where your passport and travel documents will be verified. Check-in counters for international flights departing from Sydney usually open about 4 hours before departure. Check-in counters at major U.S. airports are open throughout the day. Have your passport and travel documents ready for inspection. There are designated lanes for those passengers travelling in business class and for Delta SkyMiles® and Skyteam elite members as well as Virgin Australia Velocity Gold and Platinum members. Delta Air Lines, along with its SkyTeam and other alliance member airlines like Virgin Atlantic, offers over 200 lounge locations around the world including five in the United Kingdom, with three partner lounges available at London Heathrow and two at London Gatwick. The Delta Sky Club®1 is a truly global airport lounge created specifically for your travelers to enjoy more personalized service, comfort and productivity. Customers will enjoy a variety of perks and amenities. Think of it as a personal retreat — a home away from home. Delta Sky Club is committed to keeping your travelers fueled for their flight with healthy selections and delicious flavors. 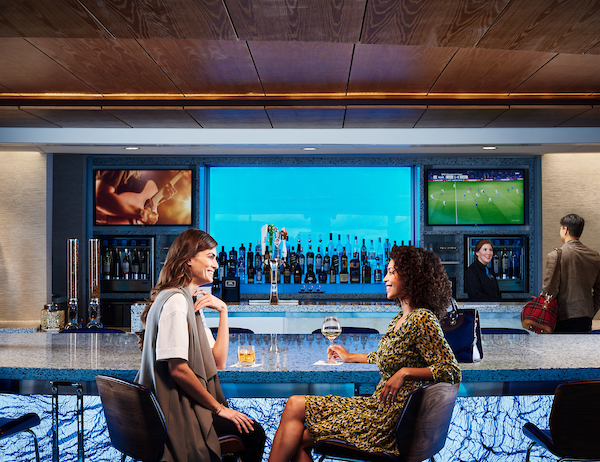 Take a seat at THE BAR at Delta Sky Club® and savor a wider selection of more premium wines and spirits, locally crafted beers, and artfully constructed seasonal cocktails. Rely on the expert Delta Sky Club staff to answer questions and ensure that your travelers get to the gate when their flight is ready to board. Enjoy complimentary Wi-Fi, business center, meeting services and other productivity tools to help keep business moving. With SkyMiles®, every trip and purchase can bring you closer to the next place on your travel wish list. Earn miles for flying and everyday activities, then use miles toward travel on any Delta Air Lines flight with no blackout dates or for rewards like upgrades, premium drinks at Delta Sky Club® and traveling with Delta Private Jets®. Flight miles are also earned on member Skyteam flights as well as other airlines such as Virgin Atlantic.